HipSaver SlimFit is a fashionable garment designed for people living independently in the community. So discreet, nobody will know that it's being worn under most clothing. The pant is made from comfortable polycotton fabric in an attractive light coffee colour and contains no latex or skin irritants. 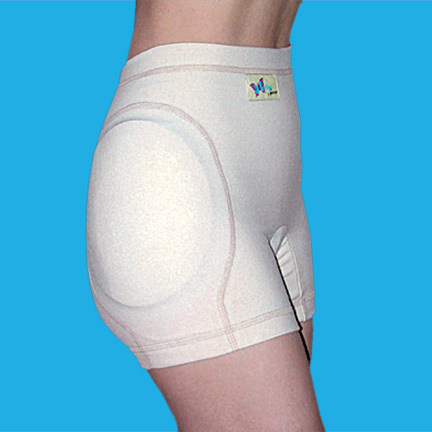 The SlimFit model will accommodate incontinence liners comfortably. The hip pads are oval in shape measuring roughly 7.5" long by 6.5" wide and 1/2" thick tapering to 1/16" at the bevelled edge. They are heat sealed into a high temperature tolerant waterproof pouch. The hip pads are odourless and contain no skin irritants or latex. HipSavers are comfortable enough to wear 24 hours a day unlike hard shell hip protectors.